The synthesis and structural characterization of a new series of ethylzinc carboxylates are reported. Structurally diverse complexes were derived from three monofunctional carboxylic acids with different numbers of phenyl groups on the α-carbon, and two bifunctional carboxylic acids with a neutral donor terminus, namely methoxyacetic and diethylphosphonoacetic acids. Donor solvents are commonly used in various transformations of alkylzinc carboxylates, therefore the effect of THF as a donor solvent on the reaction outcome was also investigated. Reactions of equimolar amounts of Et2Zn and the selected carboxylic acid in a THF solutions gave ethylzinc carboxylates with a large variety of structures. 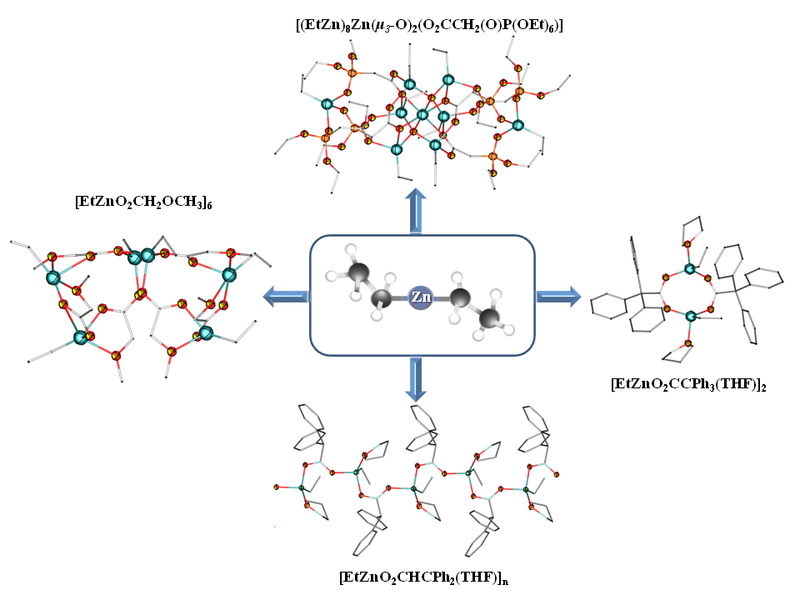 In the cases of triphenylacetic and diphenylacetic acids, a THF solvated products of stoichiometry [EtZn(O2CR)(THF)] were isolated as a dimer and a 1D coordination polymer, respectively, whereas with methoxyacetic acid, a novel solvent-free hexanuclear structural motif with a butterfly-like framework was formed, ([EtZnO2CCH2OCH3]6. The corresponding reaction with diethylphosphonoacetic acid produced a rare example of a nonanuclear organozinc oxo carboxylate cluster, [(EtZn)8Zn(μ3-O)2(O2CCH2(O)P(OEt)6)].